Our dog is now 7 months old and she is really quite well behaved all thing considered. She still tries to eat slippers and she gets too excited at the prospect of meeting someon new, jumpsall over them and licks them like a lollipop. However we can’t get her to stop jumping on the sofa. 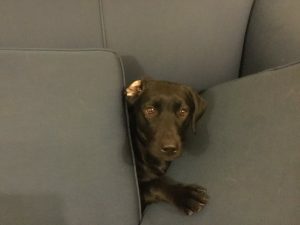 She has already nibbled the corners of the cushions so they look dog-eared, but she treats the sofa like a throne. At least she does when you are not in the room and then when she hears you coming, she jumps down. She doesn’t realise I can hear her and then she looks up at me with innocent eyes whilst lying casually on the floor. I feeel the sofa and it is lovely and warm so the evidence is there. But you haven’t seen a more innocent face! I have started putting the sofa cushions up to try and form a barrier, but clearly it doesn’t work. Really, am I not supposed to be up here on the sofa? « Christmas Trees Are Here Again!